In 2015, social media is ubiquitous. Stephen Barnard, sociologist at St. Lawrence University, is studying the way journalists use social media. Stephen Barnard is an Assistant Professor in the Department of Sociology at St. Lawrence University. 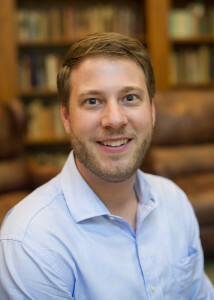 Dr. Barnard earned his Ph.D. in Sociology at the University of Missouri in 2012, where he also earned an M.A. (2007) and B.A. (2005). Before joining the faculty at St. Lawrence University, he held two interdisciplinary postdoctoral positions: one with the University of Denver’s Department of Media, Film, and Journalism Studies (2013-2014), and another with the School of Journalism and Peace Studies Program at the University of Missouri (2012-2013). His research and teaching interests focus on the sociology of new media, culture, and communication. His dissertation, entitled “Twitter and the Journalistic Field: How the Growth of a New(s) Medium is Transforming Journalism,” was nominated for the University of Missouri’s Distinguished Dissertation Award. One article from this project was recently published in Journalism: Theory, practice and criticism, and other portions of this research are currently in preparation for journal and book publication. At St. Lawrence he teaches multiple courses on the topic of technology and social change, including: Media & Society, The Web in Real Life, New Media, Conflict & Control. As a Digital Initiatives Faculty Fellow, Dr. Barnard also teaches an upper-level capstone course entitled Twitter and Society, which examines how networked actors use Twitter in response to the social unrest in Ferguson, Missouri. For more information about Dr. Barnard, see his personal website. One of the most common uses of Twitter is to collect and share information—thoughts, experiences, photos and videos, and links to other web content. Much of its appeal comes from the fact that anyone with an internet connection can speak their mind and be heard. I’m not sure if that explains why journalists are disproportionately represented on Twitter, but they are. My research focuses on what role Twitter has played in the shifts occurring in journalism as a practice and a profession. In 2009 I started conducting online participant-observations amidst hundreds of journalists and other media professionals. After identifying a few prominent hashtags I also started collecting and analyzing posts about Twitter’s place in the field. I identified eight common journalistic practices: Information collection, News dissemination, Sourcing, Public note-taking, Public engagement, Journalistic meta-discourse, Other professional (inter)actions, and Personal (inter)actions. I also found significant shifts in what I call the “elements of practice.” Many journalists reported using Twitter as something like a modern-day rolodex, which allowed them access to a constantly-updating feed of potential sources. I found that Twitter is also an important platform for journalists to build and maintain their professional reputation by sharing their work and maximizing their visibility and engagement among networked publics. Overall, reporters’ use of Twitter revealed hybrid approaches that mix traditional journalistic values with those commonly associated with online culture. These findings suggest an ongoing process of practical adaptation to the networked environment. There’s no telling what will happen with Twitter and journalism in the next few years, let alone in the next few decades. But wherever news is breaking, there will be people there reporting it. Who those people are, what platforms they use, and what values they uphold may continue to change along with our media institutions and technologies. So, stay tuned.